I knew Grandma Eaton for only 4 short years. She lived over 3 hours away, so we unfortunately didn't get to see her much, but she was still everything a grandma could be to me. Whenever we went to visit we would go to Old Country Buffet for lunch. Upon returning back to her house, although stuffed as can be, she would immediately offer us multiple sweets; Ice cream sandwiches, cookies and everyone's favorite: homemade by her and fellow church members, chocolate peanut butter and coconut balls, that she kept nice and cold in the fridge. She would show us her photo albums, with some new, but mostly old, seen-before-pictures. It made her happy to have us look through them, so we gladly did. She always had some sort of trinkets set aside that she thought we might like to take home with us. We would talk about the goings-on of other family members, watch a little t.v., sign her guest book and then head on back home. She was great about staying in touch. Calling on special occasions, and writing letters on her old typewriter. She would write about this and that, and always remembered the littlest of things: wondering how Deans work van was doing or if we had health insurance yet. She cared for her sick husband for years all on her own, before he passed last year. She was selfless, thoughtful, and caring. 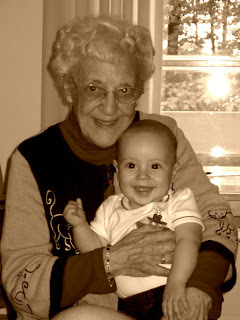 Grandma Genevieve Eaton passed away suddenly, yesterday, at the age of 89. I will miss her dearly. William only met his Great-Grandma Eaton once, but we will make sure he knows all about her! Hey there! I'm Stacey. Daughter of the Most High God, and saved by the blood of Christ. 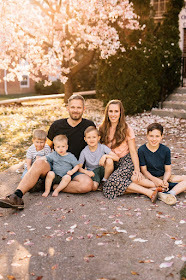 Wife to Dean, and mom to 4 amazing boys! We went camping....in a tent. Lions, and Tigers and...Dinosaurs? Oh my!